Host an awareness event at your youth group or school. Raise awareness and invite a speaker to address modern day slavery. Participate in our Post it! Campaign (Post posters with the national hotline number for human trafficking). Engage in advocacy by contacting local congressman/assemblymen to strengthen laws against perpetrators. Learn about the signs of trafficking and speak against it. Join Freedom Sunday and participate with churches around the globe to raise awareness against slavery and oppression. Host an awareness night or event. Partner with PATH and support us financially. Sponsor a Survivor through our Survivor Support Fund or give monthly to support our Enrichment Center (see our donation page). Give up your special day! Instead of birthday, Christmas gifts, etc ask people to donate to PATH to give a gift of freedom. Host a dinner or throw a party and invite friends to learn more about PATH and ask for donations. 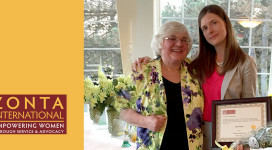 Zonta International designates Yellow Rose Award to Executive Director, Julie Palmer.